The Conpaptex Equipments adapter base is designed for Unwind Guiding use in applications where the unwind or rewind stand must be shift able. By fitting the adapter base under the stand, a simple and economical installation is obtained. If the material wound is irregular, this system guide the edge position and let it regularly into the subsequent process. 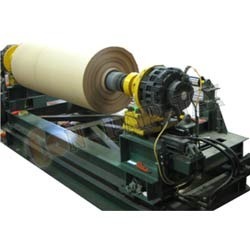 The idler roll moves with the unwinding reel stand. Mount the detector fixed and as close to the idler roll as possible. The leaving web formed an angle at the deflector roll should more than 30-. if not possible, apply a pinhole added. The important, do not allow the web slip on this roll. The distance between two rolls should be more than the maximum width of the web.